Medical education has undergone significant changes worldwide. The most crucial reason for this change has been patient safety. 'To Err Is Human', a landmark report released by the Institute of Medicine in 1999 revealed that up to 98,000 hospital deaths occur every year in the United States as a result of medical error. Simulation has been widely accepted as a training and assessment tool in medical education. In the past, trainees relied on the apprenticeship model and routine exposure to patient during their working day to gain expertise in managing such events. Factors contributing to this changing scenario are the changing patterns in health care delivery system such as shorter hospital stays and clinic visits resulting in reduced patient availability for learning, reduced exposure to critically ill patients, limitation on trainee working hours and decreased time for faculty to teach. Increased patient awareness, improved patient safety and medical litigation have resulted in the increasing use of simulator-based technology into training and assessment programmes in medical education. Failure of airway management remains a significant source of morbidity and mortality. Rose and Cohen, and Mort, reported that persistent attempts at direct laryngoscopy to secure tracheal intubations were associated with incrementally lower rates of success, higher rates of patient morbidity and a significant increase in the complications when more than two attempts were made., Conventional teaching methods may be inadequate to teach proper skills to health care providers for rare but potentially lethal events such as trauma in the emergency department and respiratory arrest in the critical care unit. 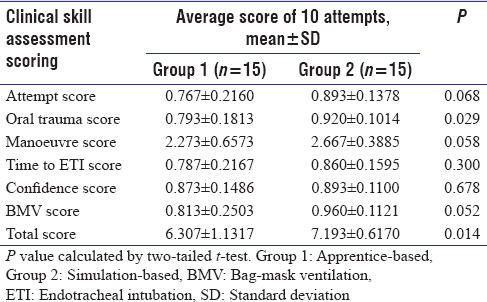 The aim of this study was to compare simulation-based training to conventional apprenticeship-based training for interns in enhancing their learning ability of airway management. Following approval from the Institutional Ethics Committee, 30 interns of a Medical College were chosen to participate in this prospective randomised interventional study. None of the interns had previous exposure to laryngoscopy (L), endotracheal intubation (ETI) and bag-mask ventilation. All participants provided written informed consent. A pre-test was conducted using a validated questionnaire consisting of 10 short answer questions. This questionnaire was prepared with suggestions from three expert faculty members of the Department of Anaesthesiology and prevalidated by a pilot study on 10 interns for its legibility and comprehensibility. Those 10 interns were not involved further in this study. The internal consistency of this questionnaire was judged through Cronbach's alpha. All interns attended didactic sessions reviewing airway anatomy, general principles of airway management, details of equipment such as laryngoscope, endotracheal tube and bag-mask resuscitator and procedure for laryngoscopy and endotracheal intubation (L and ETI). They watched a short video illustrating laryngoscopy and observed a demonstration of the procedure on a mannequin. The same questionnaire was circulated, and the interns were evaluated using a post-test. After the post-test, all interns were randomly assigned into one of two groups, each group comprising 15 interns with no prior experience in airway management. Simple randomisation was performed by 'Randomisation' Version 2.0 (developed by M Saghaei, MD, Department of Anaesthesia, Isfahan University of Medical Sciences, Isfahan, Iran). The technique of allocation was concealed using a closed envelope technique. After obtaining informed consent from the patients, interns in Group 1 (n = 15) performed laryngoscopy and intubation on patients in the operation theatre up to 5 times over 3 successive days. Interns in Group 2 (n = 15) performed up to five intubations on the airway mannequin (Laerdel™ Intubation Trainer) over 3 successive days. Regardless of the group, each intern made up to 10 attempts at L and ETI using a Mackintosh blade and proper sized endotracheal tube on anaesthetised and paralysed patients. Two observers (A and B), having experience in anaesthesiology for at least 5 years, assessed and scored the result of every attempt as 'Success' (1 point) or 'Failure' (0 point). To be scored as a success, the attempt had to be considered to be a satisfactory attempt at intubation, defined as an intubation which, if it had been made on a patient, would have achieved ETI without significant risk of adverse events. Exceeding the time limit, causing trauma to the oral structures, using optimisation manoeuvres and expression of the level of confidence along with bag-mask ventilation were evaluated and scored accordingly. These scores were summed up to give a clinical skills confidence score according to the rating scale. The average score of ten attempts was taken as the final score. Scores of the 1st and 10th attempt by Observer A for every intern were assessed and compared to evaluate the improvement in airway management while performing the mentioned procedure during the evaluation. This computation was performed to estimate the 'practice effect' during the test. While interns were blinded to the parameters scored on the scoring system, observers were blinded to their group allocation. A rating scale for the assessment of skills was developed to determine the ability of the participant to perform bag-mask ventilation, laryngoscopy and intubation. This was developed in consultation with three other faculty members of the Department of Anaesthesiology who teach airway management skills as a part of their regular teaching. The items for clinical skill assessment scale were developed from various instructional manuals and books. The rating scale consisted of six items with maximum total score of '8' and a minimum of '0'. A higher score on the rating scale represented a better performance of the intern. After revision, the experts were in complete (100%) agreement that the content of the rating scale was valid, and each item was essential and reflected performance evaluation. Interrater reliability of the rating scale was assessed by intraclass correlation coefficient (ICC). The internal consistency of the scale was judged through Cronbach's alpha. An alpha value of >0.5 was regarded as an internally consistent scale. With time and logistics at our disposal, a medical statistician of our institute considered 30 participants (15 in each group) to be enough to fulfil the objective. Continuous data are presented as mean ± standard deviation or median and compared using the paired t-test where P < 0.05 was considered statistically significant. Intergroup comparison between the average scores of attempt 1 and attempt 10 was done using the Mann–Whitney U-test and intragroup comparison between the average scores of attempt 1 and attempt 10 was done by using the Wilcoxon signed-rank test. In this quasi-experimental study, we evaluated cohorts of medical interns who were trained either on a mannequin or on patients. Each group consisted of 15 interns assigned by computer-generated randomisation with comparable age and gender representation between groups. Demographic data of the study subjects are summarised in [Table 1]. The mean score of 30 interns for post-test (18.667 ± 0.8023) was significantly greater than the scores for pre-test (14.8 ± 0.8469) (P - 0.001) [Table 2]. The average scores of 10 attempts by two independent observers are summarised in [Table 3] and [Table 4]. The total mean score of 10 attempts of simulation-based training was significantly higher than that of apprentice-based training in scores of both Observer 'A' (P = 0.012) and Observer 'B' (P = 0.014). 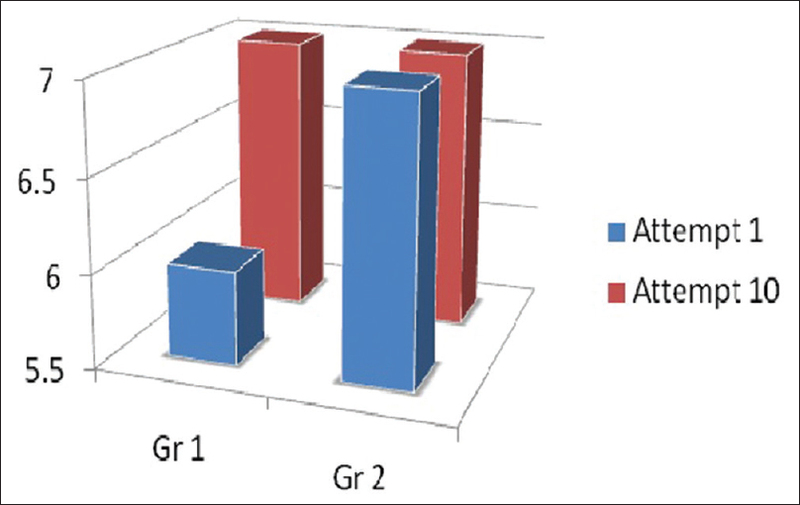 [Figure 1] shows a significant (P = 0.021) difference between groups at scores of attempt 1; however, the score was comparable at attempt 10 (P = 0.305). 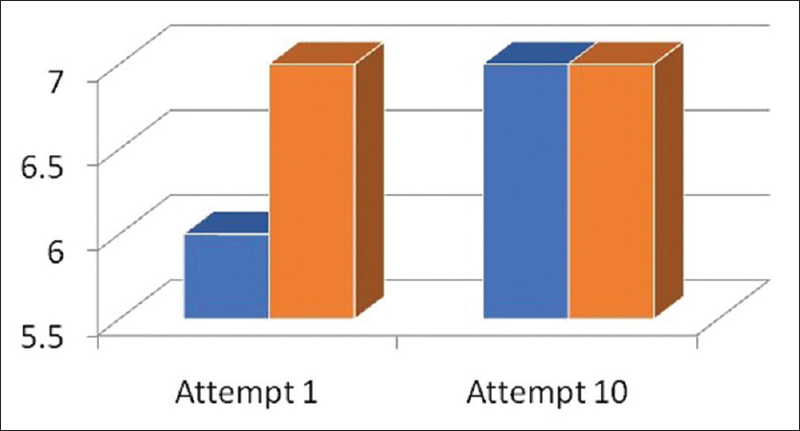 Intragroup comparison shows a statistically significant difference between the scores of attempt 1 and attempt 10 in apprentice-based training (P = 0.015) [Figure 2]. In the case of simulation-based training, there was some improvement seen though it was not statistically significant (P = 0.052). Interclass correlation coefficient was calculated between the average scoring by Observer A and Observer B. A correlation between their scoring was 0.995 (95% confidence interval: 0.989–0.997, P = 0.0001, n = 30). It was appreciably high and almost close to perfect agreement (ICC = 0.995) between their scoring. Hence, this scale appears to be a reliable rating instrument for the evaluation of the performance of the medical interns in the skill of tracheal intubation. The Cronbach's alpha for 6-item rating scale was calculated in the evaluation of Observers A and B separately. We found the Cronbach's alpha for Observers A and B was 0.630 and 0.642, respectively. Cronbach's alpha is a measure of internal consistency of rating scales. An alpha value of >0.5 is regarded as an internally consistent scale. Therefore, the developed scale was found to be internally consistent and can be reliably used for further studies. There are very few clinical outcome studies comparing simulation-based and traditional apprenticeship-based model of skill training. Simulation, in all its variants, is an excellent tool for health care educators as it allows students to achieve these goals without patients being put at risk. Gaba noted that simulation has the potential to revolutionise health care and address patient safety issues if appropriately utilised and integrated into the educational and organisational improvement process. Trainees can make errors and learn to recognise and correct them in the simulated environment without fear of being penalised or causing harm to patients. Rosenthal et al. found simulation to be a safe and valid evaluation and training tool for emergency airway management skills of interns. Basic airway management is a major component of resuscitation. The impact of a basic airway skills simulation programme on residents is tremendous with significantly better performance on most elements of basic airway management during mock codes. Trained residents also showed improved performance on actual patient scenario during the follow-up period. Knudson et al. provided 10 h of trauma education by either scenario-based didactic sessions or scenario-based simulator sessions to two groups of surgical residents. It was found that the simulation group had higher performance scores for crisis management skills, specifically with regard to teamwork. A retrospective case log review and simulator testing that compared the acute cardiac arrest management of residents trained by simulation and those not trained on the simulator showed that students learning new material with the use of simulation retained knowledge further into the future than students studying with more traditional methods. Valadares andMagro studied 55 nursing students who were divided into a control group that did a curriculum internship in a hospital setting and an experimental group that participated in a realistic simulation before the hospital setting. Both groups answered an instrument based on the Likert scale to verify the effectiveness of the two teaching strategies. They found that 69% totally agreed that simulation consolidated the teaching-learning process and most students (38.5%) totally disagreed with internship in the hospital setting as an isolated strategy. The realistic simulation was effective in acquiring and refining knowledge. We found in our study that the practice effect increased the score from 1st attempt to 10th attempt, thereby increasing the practical skill. A study in which 71 emergency medicine residents participated showed improvement in knowledge and practical skills after a 3-h brain-based learning and simulation course in basic airway management. The mean knowledge assessment score increased from 6.0 to 8.9 after the course (P = 0.00) and the practical skills scores increased from 22.8 to 27.0 (P = 0.03). Plummer and Owen developed statistical models to describe learning ETI on 100 participants undergoing ETI training using different airway trainers. They found that the trainees became familiar with the airway trainer after multiple attempts and the rate of successful ETI increased from 6% from 1st trial to 80% after 15 trials only with a single airway trainer. Each trial was scored as a success or failure which was the primary outcome used in their analysis. There are numerous mannequins with varying degrees of fidelity that may be used for teaching intubation skills, none of which is clearly superior to the other. In this study, we used the intubation torso (Laerdel™ Intubation Trainer) to teach the principles of routine, uncomplicated intubation. Weinberg et al. reviewed the use of simulation for paediatric training and assessment. It was evidenced that simulation-based educational interventions had great potential as a teaching and assessment tool for paediatric acute care providers. It also increased the retention of knowledge for resuscitation, trauma care, airway management, procedural skills, team training and disaster management. LeBlanc et al. established the importance in integrating simulation at the postgraduate level as well as the development of faculty in creating a positive impact not only on learning and patient safety but also curriculum and research development. DeMaria et al. investigating the use of simulation for assessment and retraining of physicians utilised an adaptable 2-day simulation-based assessment conducted by two board-certified anaesthesiologists. They found that anaesthesiologists seeking to return to active clinical settings were benefitted by fine-tuning their skills in a simulated environment. It also provided an effective means of assessing baseline competency and retraining physicians. The results of this study suggest that simulation-based teaching is more effective than the traditional apprenticeship-based model in teaching airway management skills. Simulation has considerable application in testing airway devices as well as teaching procedural competence. All health-care practitioners should embrace simulation as a tool to aid teaching and learning across a wide range of cognitive, behavioural and psychomotor competencies. Future research should focus on establishing timelines for periodic education and the role of simulation-based experiential learning to enhance existing curricula, to prevent knowledge decay and to reinforce safe practice. The use of simulation-based assessment and retraining is a promising and innovative tool that deserves further exploration. A number of factors and limitations should be considered in interpreting the results of this study. Results could vary among different raters depending on their assessment stringency. The degree or quality of feedback could also vary among individuals. Finally, the training could have been better if different mannequins (such as normal configuration, long face and edentulous) were used for training. Medical schools and residencies are currently facing a noticeable shift in their teaching paradigm. The increasing amount of medical information and research makes it difficult for medical education to stay current in its curriculum. Patients are highly concerned about students and residents 'practicing' on them and students, on the other hand, feel that they are inadequately trained in history taking, physical examination, diagnosis and management. This leads to a conflict between patient safety and quality against teaching and education. Despite efforts from educators to set a more independent and self-directed learning approach and curriculum, a disconnect still exists between the classroom and the clinical environment. Medical simulation has been proposed as a technique to bridge this educational gap. Simulation has been tested as a means of educating and training the medical students as well as other health-professional students in a realistic manner as a part of their preparation for clinical courses. Various institutions with simulation laboratories provide educational sessions on basic and advanced training in cardiopulmonary resuscitation, as well as training to develop skills in airway management including medical management of skills related to dyspnoea. Thus adaptation of simulation-based curricula may target more thorough integration of different kinds of skills to improve real time clinical care, patient safety and long term outcomes in health care. Kohn LT, Corrigan JM, Donaldson MS, editors. To Err is Human: Building a Safer Health System. Washington: National Academies Press (US); 2000. Flexner A. Medical Education in the United States and Canada: A Report to the Carnegie Foundation for the Advancement of Teaching; 1910. Available from: https://www.ncbi.nlm.nih.gov/pmc/articles/PMC2567554/pdf/12163926.pdf. [Last accessed on 2018 Dec 05]. American Council on Graduate Medical Education. Program Requirements for Graduate Medical Education in Surgery: Common Program Requirement, Effective. American Council on Graduate Medical Education; 01 January, 2008. Higham H, Baxendale B. To err is human: Use of simulation to enhance training and patient safety in anaesthesia. Br J Anaesth 2017;119:i106-14. Aggarwal R, Mytton OT, Derbrew M, Hananel D, Heydenburg M, Issenberg B, et al. Training and simulation for patient safety. Qual Saf Health Care 2010;19 Suppl 2:i34-43. Gaba DM, DeAnda A. A comprehensive anesthesia simulation environment: Re-creating the operating room for research and training. Anesthesiology 1988;69:387-94. Satava RM. Virtual reality surgical simulator. The first steps. Surg Endosc 1993;7:203-5. Bradley P. The history of simulation in medical education and possible future directions. Med Educ 2006;40:254-62. Peterson GN, Domino KB, Caplan RA, Posner KL, Lee LA, Cheney FW, et al. Management of the difficult airway: A closed claims analysis. Anesthesiology 2005;103:33-9. Cheney FW. The American Society of Anesthesiologists Closed Claims Project: What have we learned, how has it affected practice, and how will it affect practice in the future? Anesthesiology 1999;91:552-6. Rose DK, Cohen MM. The airway: Problems and predictions in 18,500 patients. Can J Anaesth 1994;41:372-83. Mort TC. Emergency tracheal intubation: Complications associated with repeated laryngoscopic attempts. Anesth Analg 2004;99:607-13. Plummer JL, Owen H. Learning endotracheal intubation in a clinical skills learning center: A quantitative study. Anesth Analg 2001;93:656-62. Gaba DM. The future vision of simulation in health care. Qual Saf Health Care 2004;13 Suppl 1:i2-10. Rosenthal ME, Adachi M, Ribaudo V, Mueck JT, Schneider RF, Mayo PH, et al. Achieving housestaff competence in emergency airway management using scenario based simulation training: Comparison of attending vs. housestaff trainers. Chest 2006;129:1453-8. Mayo PH, Hackney JE, Mueck JT, Ribaudo V, Schneider RF. Achieving house staff competence in emergency airway management: Results of a teaching program using a computerized patient simulator. Crit Care Med 2004;32:2422-7. Knudson MM, Khaw L, Bullard MK, Dicker R, Cohen MJ, Staudenmayer K, et al. Trauma training in simulation: Translating skills from SIM time to real time. J Trauma 2008;64:255-63. Wayne DB, Didwania A, Feinglass J, Fudala MJ, Barsuk JH, McGaghie WC, et al. Simulation-based education improves quality of care during cardiac arrest team responses at an academic teaching hospital: A case-control study. Chest 2008;133:56-61. Valadares AF, Magro MC. Opinion of nursing students on realistic simulation and the curriculum internship in hospital setting. Acta Paul Enferm 2014;27:138-43. Clapper TC, Li T, Trueger NS, Okuda Y. Gauging the effectiveness of brain-based learning and simulation instruction in an airway management course for emergency medicine residents. J Emerg Disaster Med 2012;6:1-5. Wang EE, Quinones J, Fitch MT, Dooley-Hash S, Griswold-Theodorson S, Medzon R, et al. Developing technical expertise in emergency medicine – The role of simulation in procedural skill acquisition. Acad Emerg Med 2008;15:1046-57. Weinberg ER, Auerbach MA, Shah NB. The use of simulation for pediatric training and assessment. Curr Opin Pediatr 2009;21:282-7. LeBlanc VR, Bould MD, McNaughton N, Brydges R, Piquette D, Sharma B. Simulation in Postgraduate Medical Education. Members of the FMEC PG Consortium; 2011. DeMaria S Jr., Samuelson ST, Schwartz AD, Sim AJ, Levine AI. Simulation-based assessment and retraining for the anesthesiologist seeking reentry to clinical practice: A case series. Anesthesiology 2013;119:206-17.